One thing I was adamant about regarding Milton's party invitation was a start and end time for the party, 1:00P.M. - 4:00P.M. If you know me, I like to arrive to events late, as late as politely possible, and leave early, as early as politely possible. I love having friends, but I can only flit around like a social butterfly for a brief period before I start to descend! That being said, I really wanted Milton's party to run like a real live kid's birthday party. That's why we needed games and activities, of which we had a few. The first one you saw in yesterday's post was to "Guess the Number of Bones and Win all the Bones!" This was a simple way to get people engaged and hand out a prize. One of the very best parts of the party was "The Ball Drop." About a month before the big day, Jeff showed me a YouTube video where a dog owner is up on his roof and throws one tennis ball down for his dog, followed by another, one more, and then a whole heap of them. The poor dog went wild! I positively loved this idea, so I promptly asked the tennis coach at our school for ball rejects. He quickly obliged with about 30 balls. See the fun that ensued! 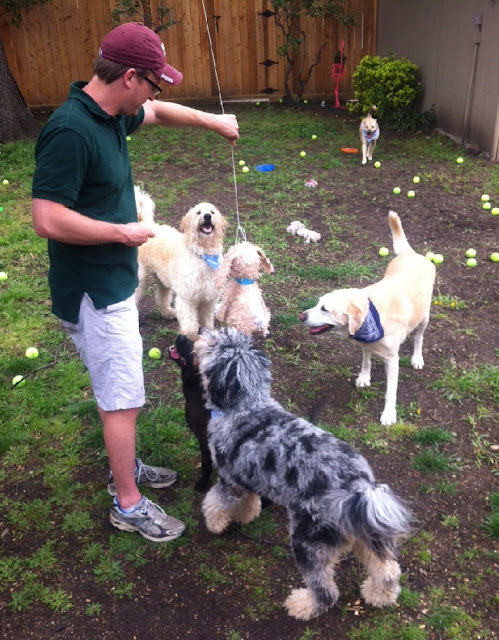 If you ever throw a dog party, I highly recommend a ball drop! I only wish that I waited for all 13 dogs to arrive before I began. At the party, we also had a Wet & Wild area with watering holes and a pool. The funny part about the pool was I called and called for a month prior to the party to try to land one of those bright blue kiddie pools. No one, Wal-Mart, Target, local dollar stores, had any! Finally, the Thursday before the party, Dollar General received a shipment of these priceless plastic pools. I rushed over with my little Toyota Corolla, with the back seats down (I just learned how to do that! 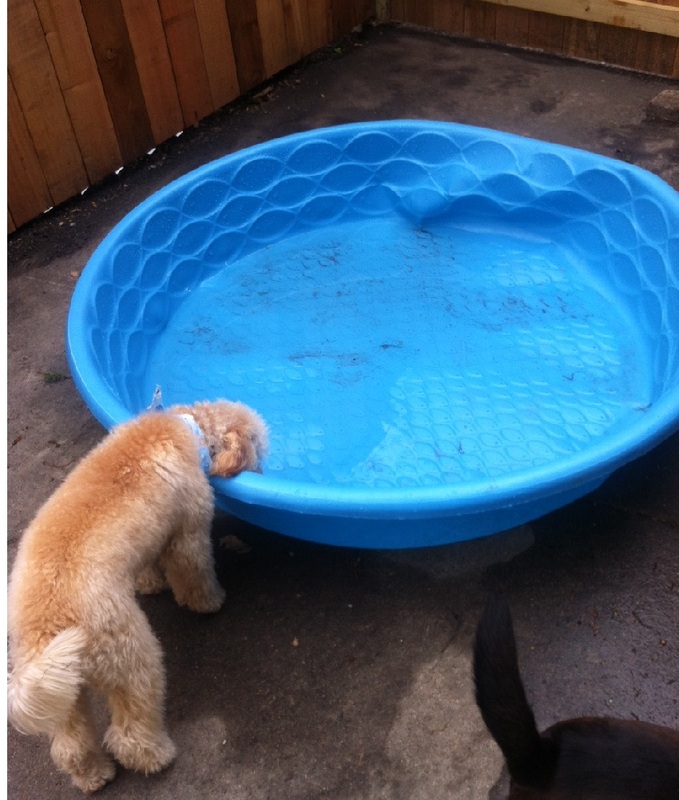 ), and to my chagrin, that pool just wouldn't fit! What's a girl to do? I walked the pool home at rush hour through Dallas's city streets - one solid mile. If you don't believe me, I google mapped it. That's what love for a dog is, folks. 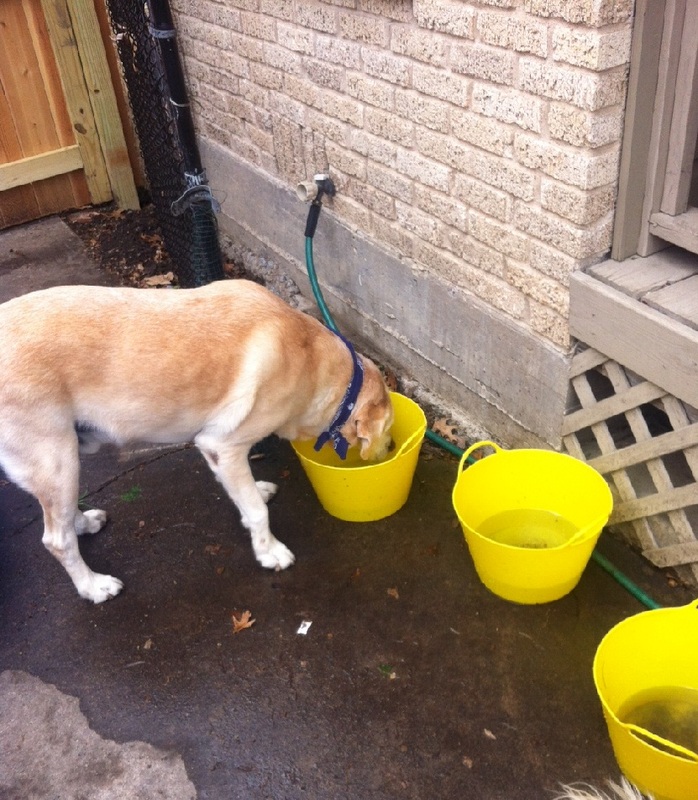 Unfortunately, Jeff (the party pooper) would not let me fill the entire tub full of water because he was worried about muddying up people's dogs. So, we had just a few inches of water in there for the dogs to wet their feet. If you decide to throw your own party, I encourage you to fill it right on up! Next, we had a dog trick contest, which consisted of me climbing up on a chair, clamoring for attention and cajoling someone, anyone to share a trick that his or her dog does well. As I was standing there, waiting for eager entrants that just weren't coming, my good friend, David, took the leap (to save me, and I was ever so grateful! ), and he got his dog to turn a trick! After that, we had a few more contestants and two prizes were given out - $5 Starbucks and $5 PetCo gift cards. That's just enough to get one fancy drink or one fun toy. Of course, what is a party without a pinata...? 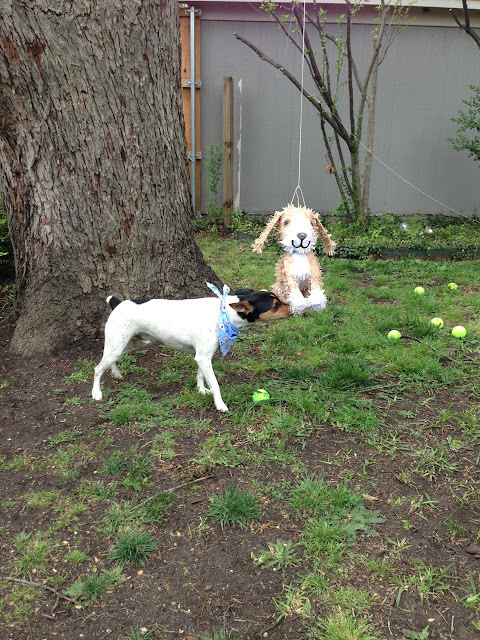 A dog pinata at that! The other boys showing an interest. Jeff's little cousin getting ready to strike! Sadly, the pinata was down with only two strikes. None of the adults even got to take a go at it! There is no picture of all the dogs rushing for the treats because I actually had to lift them out of the fallen pinata. I vacillated on whether or not to have human candy or dog treats, but then I went with individually tied-up bags of sweet puppy treats. It was probably much, much safer that way. As for food, I wish I had more photos! As I prepared right up to party start and people began streaming in (My buddy, Emily, began grilling those hots for me! ), I lost all hope of snapping a whole album of shots. Here are a few though. 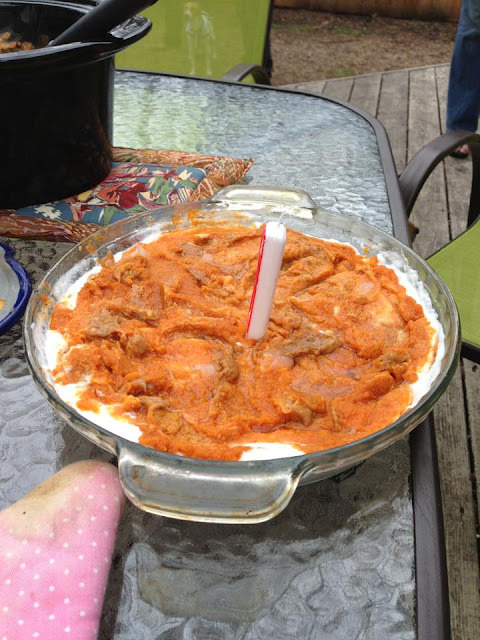 I kept the cake simple and cold - fat free plain yogurt layered with all-pumpkin puree, drizzled with peanut butter. Milt was pretty excited. 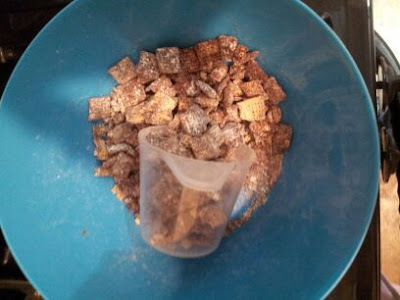 If you have never made puppy chow before, it is super simple. All you need to do is heat chocolate chips in a pot and toss in some form of Chex cereal. Stir to coat and then cover with powedered sugar. Yummy! I also made queso, served with chips, because I live in Texas now, and it just seems like the thing to do. Of course, the main course was hot dogs. It just had to be. I joined those with every type of salad - vegetable, pasta, and fruit. My good friend, Lindsay, brought over delicious triple layer bars (cookie dough, Oreo, and brownie) along with some peanut butter stuffed chocolate cookies. For my part, I baked a simple brownie mix and homemade cupcakes with cream cheese frosting topped with paw prints! I am always sorely disappointed when I slack off on taking photographs at memorable events. I guess that means I am too busy making memories to save them on film. That's not a bad thing either! If you have a free moment, head on over to Cait's blog. She is all about fitness in Dallas, and you can certainly learn an awful lot of good information about getting in shape or even hire her as a personal trainer. Happy Thursday, everyone! The weekend has practically arrived. So sad we live so far apart, that looks like the best dog party EVER! So funny, that picture where you threw all of the balls? Stanlee would have frozen in anxiety not knowing which way to go or which ball to grab first, second, third, fourth or fifth. He is no longer permitted more than one ball at a time due to his inability to handle his ADHD and his inability to focus as a normal dog would and not one that cannot handle his attention deficit disorder. It stinks that we live so far apart, looks like the best birthday party EVER! That third picture cracks me up; Stanlee would have frozen with anxiety at all of the balls being thrown at once. Which one to grab first, second, third, fourth, or fifth? He would have tremble with excitement and hyperventilated all due to his inability to handle his attention deficit disorder. I am not sure why your posts are getting stuck in SPAM.... We will look into it. We were disappointed when we noticed less postings from you before we realized the problem. Thanks Aggie, I was sad there for a few days but now I'm back in my happy place.